Straddle. An alternative name is Long Straddle. Neutral position. It is a combination involving an equal number of long puts and long calls at the same strike price and the same expiration date. It is a debit combination, which means you must pay to put on the position. The strategy profits when the price of the underlying security moves up or down beyond the breakeven points. Buy to open one at-the-money (ATM) call and simultaneously buy to open one ATM put. Both options derive from the same underlying stock and have the same strike price and expiration date. The advantage of this combination is that it benefits from volatility, independent of the direction of stock price movement. Both the put and the call have (potentially) unlimited upsides but limited loss exposure. Fig. 1, P&L chart: The X axis is price and Y axis is profit/loss. The range of the Y axis is maximum loss to potential gain. The domain of the X axis is centered on the strike price. Premium paid, which equals the premium on the call plus the premium on the put. Occurs when the underlying’s price at the expiration exactly equals the strike price. There are two breakeven points on a straddle. The upper breakeven point equals the strike price plus the premium paid. The lower breakeven point equals the strike price minus the premium paid. 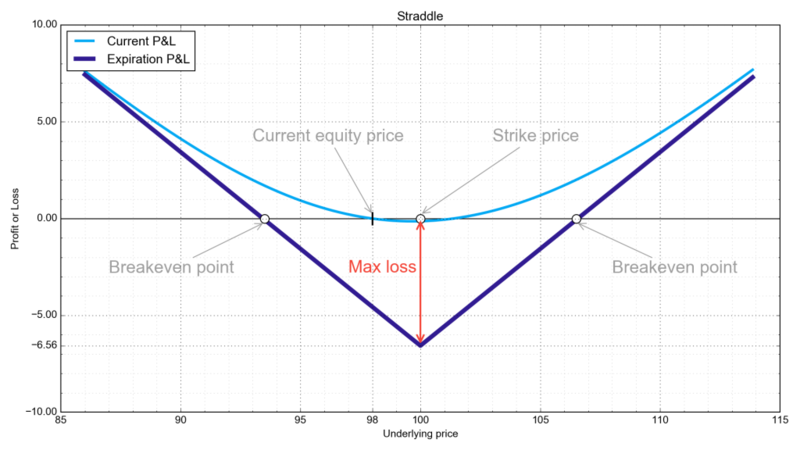 On a profit/loss chart (see below) where the X axis is price and the Y axis is profit/loss, the value of the combination is a minimum at the straddle’s strike price. The strike price forms the base of a V-shaped curve, that is, two diagonal lines with opposite slopes that rise from a point with (X,Y) coordinates of (strike price, stock price minus premium). The maximum loss, at the strike price, is the premium. The left (put) leg of the V rises as the stock price falls and is bounded by the y-axis. The right (call) leg of the V rises without limit as the stock price rises. The left and right legs of the V cross the X axis at the breakeven points. You would put on a straddle in the hope that the underlying stock will quickly break out or break down from the strike price. 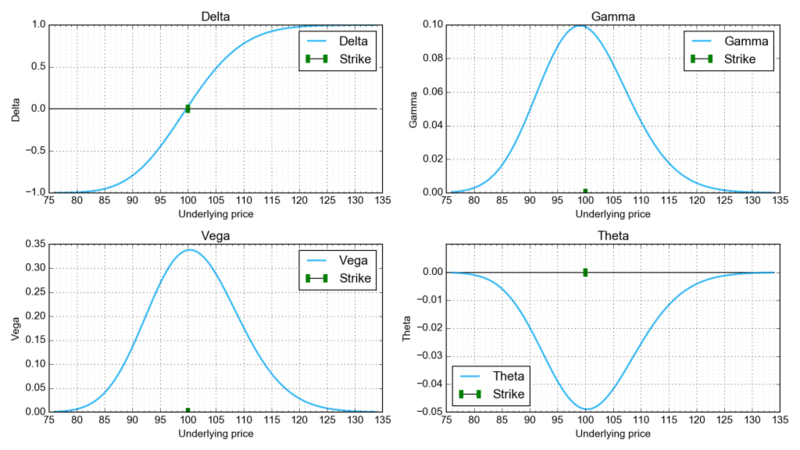 You would choose an underlying stock that is relatively volatile, as this increases the chances that the stock price will move away from the strike price (see the vega chart). You don’t need an opinion on price direction to profit from a straddle, if the stock price moves a sufficient amount. Some traders put on straddles just ahead of a corporate announcement, jury verdict or earnings announcement, in the hope the news will move the stock price. Your biggest fear is that the price of the underlying stock will not move far enough away from the strike to recoup all your premium. An option’s probable price movement in relation to the price movement of the underlying stock. The value ranges from 0 to 1 for a long call and -1 to 0 for a long put where 0 means the option price is not affected by the stock price, and 1 means the option prices moves penny for penny in lockstep with the underlying’s price. Delta of whole spread thus ranges from -1 to 1. At the strike price of a straddle, the deltas of the put and the call cancel each other out, which is why the straddle is delta neutral. There is a wrinkle when the stock price does not exactly match the strike price. If the call is slightly in-the-money (ITM), it will have a slightly higher delta value than will the put, giving you a positive delta position that, in the short term, gains on the upside and loses to the downside. The reverse is true if the put is slightly ITM. This is only a concern if you sell to close the straddle before expiration; If you hold till expiration, the effect of a slightly non-neutral delta evaporates. The effect of the underlying stock’s volatility on the option’s price. For a straddle, higher vega translates into higher option prices, all things being equal. For example, a vega of 0.3 means that an option’s price will rise by 30 cents for each point increase in the underlying stock’s implied volatility. Buying a straddle during periods of high implied volatility can be disadvantageous, because a volatility crunch will collapse the time value of the put and call premiums. The time decay of an option’s price as the expiration date approaches. At the close of expiration day, the option’s theta is 0. Theta is lower for long expiration periods, which means the option loses time value more slowly than it would for short expiration periods. A longer expiration period increases the chance that the combination will expire in the money. Theta for a straddle is negative (which means the combination loses value over time) because the options lose value over time due to time decay. This is the rate of change of delta – the responsiveness of the position to the underlying’s price movement. In a straddle, gamma is positive, which means delta will increase in the direction of the stock move. On an upward stock move, a positive gamma dictates that the delta of the straddle becomes increasingly positive, while on a downward stock move, the straddle’s delta becomes increasingly negative. You can thus profit from a move in either direction with a straddle. Fig. 3, Time decay animation Describing physics of what’s going on with combination’s price when time goes towards expiration. Fig. 4, Volatility dependency animation Describing physics of what’s going on with combination’s price when an implied volatility rises or falls down. Assume its mid-January and United Technologies (UTX) is trading at $110.00. Buy to open 10 UTX March 03 110 calls for $2.60 each, buy to open 10 UTX March 03 90 puts for $3.20 each. Neglect commissions. $2.60 + $3.20 = $5.80. You pay $5,800. This is a debit combination with limited risk and unlimited reward. Here are two things you can do. If the underlying stock moves beyond the breakeven point, you can sell to close the out-of-the-money (OTM) option to recoup a little of the premium. If the ITM leg has gained significant value despite time decay, you can sell the ITM option for a substantial profit. You can sell to open an option (put or call) one strike further OTM than the strike for the favored leg, thus converting one side of initial straddle into a vertical spread. This will compensate you for the initial premium you paid. You could sell to close the OTM option and use the proceeds to buy more contracts of the in-the-money option, at a strike price of your choosing. If you have a mildly bullish inclination, you can put on a strap, which is a straddle with more calls than puts. If you have a mildly bearish inclination, you can put on a strip, which is a straddle with more puts than calls. You’ll make more profit with either variation than you would with a straddle when you correctly guess the direction of stock movement, but you’ll profit less if you guess incorrectly. If you already own the underlying stock, you can create a synthetic straddle by purchasing ATM puts. Similarly, if you have already shorted the stock, you could buy ATM calls. This works best when the stock price is very close to the option strike price. A straddle limits your losses to some amount between zero and the premium if the stock price remains between the two breakeven points. There is no profit limit on the upside, and the downside profit is limited only to the extent that a stock price can’t fall below zero. If the stock price moves substantially, your ROI will be smaller than it would be from a naked long call or put position, but you would have to correctly guess the direction of the movement to realize the higher ROI. You might be able to make a profit on a straddle even if the stock price doesn’t move. This is possible only when the implied volatility of the straddle jumps soon after purchase and thereby expands premiums (through an increase in time value) above the amount you paid. You could then sell the straddle for a profit, albeit probably a small profit.